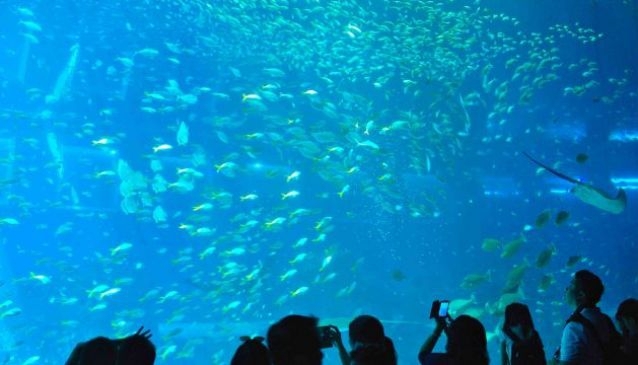 Located within Resort World Sentosa, on Sentosa Island, S.E.A Aquarium is one of the key attractions of the Marine Life Park. Marine Life Park aims to raise awareness on oceans and their ecosystems in order to better understand and protect them. Through the South East Asian Aquarium better known as S.E.A. Aquarium, you will discover our world's oceans with not less than 10 habitats and over 800 species of marine animals. Strait of Karimata and Java Sea: track down the aquatic creatures wandering through a real size shipwreck. Strait of Malacca & Andaman Sea: Walk across a floor of glass and get a closer look at the sea star and other creatures at the Discovery Touch Pool. Bay of Bengal & Laccadive Sea: Discover mangrove inhabitants such as mudskippers, spotted scats and silver batfish. Open Ocean: This is the planet's largest window to the ocean, an amazing state-of-the-art aquarium, preserved shelter to gentle giants of the sea including the leopard shark, goliath grouper, Napoleon wrasse and a first-time-seen squadron of splendid manta rays. Arabian Gulf and Arabian Sea: is one of the world's largest marine sanctuaries . You'll find in this habitat some unusual semi-aquatic creatures including blue-spotted stingray, schools of glistening sweeper and silver batfish. Red Sea: the world's northernmost tropical sea, is home to coral reefs and here you'll observe some fairy basslet, yellow boxfish and orange striped triggerfish. Ocean Journey: enter the charming world of synchronised fish (school of fish swimming simultaneously) and translucent sea jelly species like the trailing long-tentacled lion's mane sea jelly, the captivating neon blue sea jelly and the larger-than-life moon sea jelly; Meet the famous giant spider crab found in cold water habitats and this is also where you will soon encounter the graceful Indo-Pacific bottlenose dolphins. East Africa: It showcases some marine animals of Lake Victoria and Lake Tanganyika The two freshwater lake habitats of Africa. Look out for the predatory African tigerfish, the piranhas of Africa! South China Sea: Lionfish, rubble and squirrelfish are some of the star creatures found here. Your children also will enjoy crawling into the 'cave' and get a 360 vista while popping their head through a glass dome and spy for some moray eels. Shark Seas: the tunnel dome is found towards the end of the exploration with an impressive variety of sharks such as the scalloped hammerhead shark, the powerful silvertip shark and the sandbar shark. The great news is that when you purchase a ticket for the S.E.A. Aquarium it also entitles you to an entry to The Maritime Experiential Museum as you need to enter the Museum to access the aquarium. If you would like to enjoy one of the eleven duplex suites with floor-to-ceiling windows to the Open Ocean habitat, make your reservation at the Beach Villas hotel in Resort World Sentosa. The Ocean Suites are available from $3000 a night. The S.E.A. Aquarium will fascinate all the aquatic life enthusiasts as they will discover the ocean like never before!